These puppies are a treat. Combine catfish, sweet potatoes, and pickle tartar sauce – that’s some good eating. Peel sweet potato and grate on the medium grate on the box grater, be careful of your knuckles. Add to large bowl. Rinse fish under cold water and pat dry with a paper towel. Season fish with cajun seasoning, lightly or heavy – to your liking – and place on parchment paper lined pan. Slice 1 lemon into thin round slices and place over them over top of seasoned fish. Bake on top rack for 15 minutes. When done, allow to cool down for 5 minutes, then add to sweet potatoes. With a fork mash fish and mix together well. Add juice of 1/2 lemon and mix in. Add cinnamon, a pinch of salt and a little heavier on the pepper. Then add hushpuppy mix a little bit at a time, stirring well. If needed, add other half of lemon and stir if seems to need a wetter consistency. *add diced jalapeno peppers if you want them spicy! Heat oil to 350′. Drop a Tablespoonful of mix into oil. It will bubble, fry for 3-5 minutes til deep golden brown. 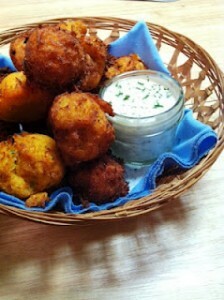 Fry hush puppies in batches. Allow to drain on a paper towel and cool down a bit before eating. Enjoy with tartar sauce or butter. Great next day! Chill in fridge for 10 minutes, and serve alongside sweet potato catfish hushpuppies.